The epidemic strikes only those who have passed through puberty. The story begins on a small island off the coast of Maine. Everyone is excited and looking forward to seeing the rare night of the purple moon. Scientists have predicted that there will be a comet that will past over the world and leave space dust in it's tracks making the moon and everything a beautiful purple hue. People around the world are waiting for this rare phenomenon to take place, but once it really does happen this beautiful event takes a turn for the worst leave nothing but death it it's wake. A bizarre epidemic strikes the earth and most everyone in it. All adults suddenly die leaving young children and teens alive. The purple space dust left by the comet contains germs that attack adult hormones. Anyone on earth who has yet to reach puberty is safe....for now. Abby and her bother Jordan and sister, Toucan are left among the living. They find their father dead and their Mother never made it back home. Abby soon comes it find out that other children near by and around the globe are experiencing the same thing as them. With all adults now dead Abby needs to find answers and fast. The worlds resources are dwindling and soon to be gone all together. When good news comes over the airways Abby finds out a group of adult Scientist have stayed safe underground and now at working hard to make a antidote to save whomever is left. With time as the enemy Abby, her family and friends new and old must find a way to get this antidote before it's to late. I feel in love with this book from page one. I adore books about the end of the world. This scenario of the end of the world totally blew me away. I was not expecting such a fantastic and gripping tale. I was on the edge of my seat needing to know what was going to happen next. Abby is such a strong leading character and never once gave up hope of finding a cure. She fought braving the entire time and would do anything for her family to stay alive. The story itself was very neat and original. I was so engrossed within the plot and needed to find out if Abby and the rest of the children of the world would prosper or die off as well. Author Scott Cramer has written such a captivating beginning to this series. 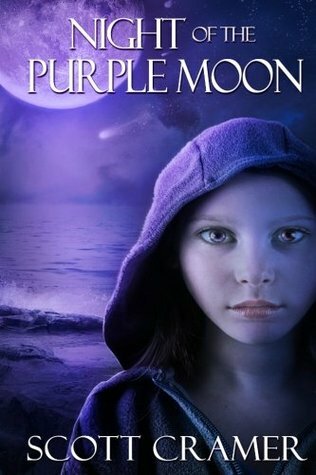 Although The Night of the purple Moon is a short read it never lacked anything. The only reason why I have given the book 4 stars and not 5 is simply because I happen to find a spelling error as well as near the end of the book in a couple area's got confusing to me. I felt this part could have been explained a little better. Other than that I really enjoyed the book and will so be reading the next in the series.